Need to Vent! 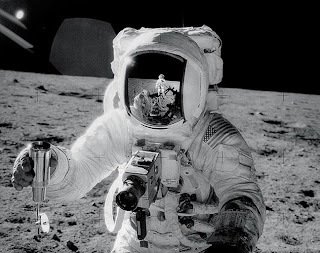 — Movie Reviews with a Twist: CONSPIRACY THEORY: DID WE LAND ON THE MOON? As you know, some have withstood the test of time and will continue to intrigue millions for many years to come. The JFK assassination and the mysteries surrounding Marilyn Monroe's death are just two examples. Others are quite controversial today, but they haven't yet grown into legendary status. For example, the events of 9/11 have spawned a dozen or more proposed conspiracies, but whether any of these remain hotly contested a generation or two from now is uncertain. In a documentary that aired on the Fox Network in 2001, it is suggested that the most expensive movie ever made was that of the Apollo moon landing in 1969. Even if a large part of the forty billion dollar budget was actually spent by NASA trying to do the damn near impossible, there was plenty left over to dwarf previous big budget extravaganzas like SPIDER-MAN 3 at $250,000,000, or KING KONG (2005) at $207,000,000 or TITANIC (1997) at a mere $200,000,000 once the need to fake the whole deal became apparent. Or so declare Producers John Moffet, Bruce Nash and Craig Titley. CONSPIRACY THEORY: DID WE LAND ON THE MOON? is a very persuasive, well-crafted look at many highly disturbing anomalies in what we have seen and what we have been told. And, unlike Michael Moore who all-too-often strays off the subject thereby diluting his point of view, Moffet et al stay focused and will leave you scratching your head in wonderment. That's a promise. With computers that are less advanced than the cheapest Nokia cell phone and with Mission Control scientists wearing clip-on ties, the Apollo moon landing was either the greatest accomplishment against all odds in human history -- or -- it was the single greatest cinematic hoax of all time. 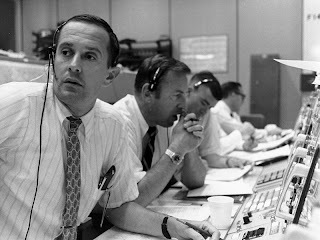 It is for you to decide, but don't do so until you have seen CONSPIRACY THEORY: DID WE LAND ON THE MOON? Orson Welles, Sidd Finch, P. T. Barnum and D. B. Cooper would all agree. I recently saw a documentary that attempted to debunk the debunkers of the moon landings. One glaring item was the assertion that the space crafts of that time period had computers less powerful than a modern wrist watch. The debunker debunkers pointed out that almost all of the critical computer calculations were performed by much more powerful (although primitive by today’s standards) computers on the ground. Also, the “flag blowing in the wind” and shadow anomalies were easily explained. Of all the curious bits of evidence, only one struck me as truly suspicious, the dust beneath the lunar module that should have been cleared away by rocket exhaust. Like so many conspiracy theories, truly mysterious points of interest are buried in mountains of painfully obvious hyperbole and melodrama. But then again, maybe I’ve been duped by the “man,” or worse, probed and microchipped by the Military Industrial Complex. That is not out of the question, I did wake up groggy and sore a few weeks ago. Thank you for your comments. On a scale of 1-10 regarding the moon landings, with 10 being they occurred exactly as NASA claims and a 1 being they were all definitely a huge hoax, I would say that we find ourselves at about a 6 on this issue. Having said this, I also think that we may be leaning more and more to the conspiracy side as time goes by and we discover additional government lies and misrepresentations. Again, thanks for the input. Please feel free to write anytime.